Are you still using Facebook? Why? Once upon a time, when I started using Steemit, in the early of January 2018, there is a suggestion to left/delete facebook. Why? Because there is a huge of hoax spread around. Yes, indeed. Do I follow the suggestion? Deleted facebook? No. I still using facebook, as well as twitter, instagram and linked in up to now. Why? Here are some reasons. 1. Communities on Facebook Group and Fan Pages. 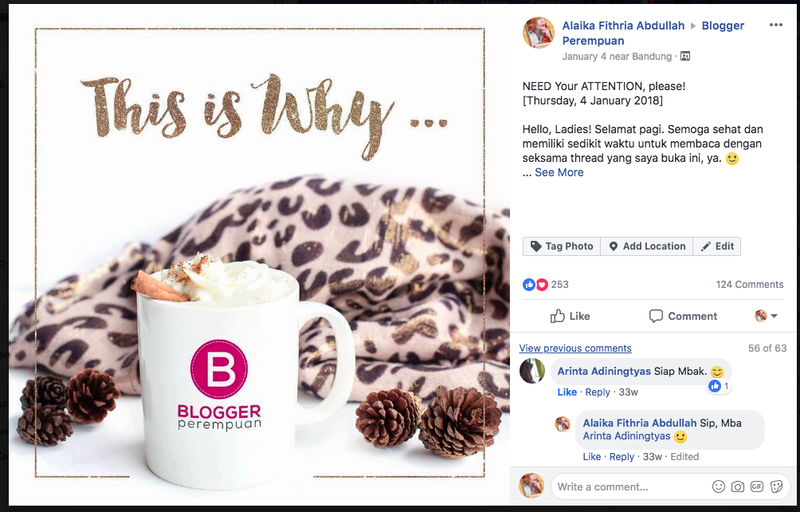 I am managing a largest Indonesian Female Blogger Network, which use facebook fan page and facebook group, as the media for our community to share, discuss and inspiring each other. We also use this media to share info related to job vacancies, campaign, buzzing info, etc. I am also the social media officer for another blogger community based in Bandung, whose also use facebook group for coordination, sharing info, and interaction among member there. Besides facebook, of course, my communities also use another social media such as twitter and instagram, as well as linked in for to run our program and communities. 2. My media to Share the Links of My Steemit Post. After posting on steemit, or other blogs, usually, the best way to invite visitors are by sharing our links of the post (the URL) through our social medias, so that our followers will aware that we have some thing interesting to be visited. Yes, the best way to share our links are on our own social media, such as facebook and twitter, and some through the groups. But, of course we have to notice that sharing the links on lots of facebook groups at the same time could risk spamming issue and made us being banned. We have to be wise as well. 3. My Families, Friends and Colleagues are Here. Yes, I believe that you are aware that nowadays, facebook grows as a biggest social media where people to connect each others. Nobody can reject the fact, right? Even-though there are lots of hoax and negativity on facebook, but since they all are there, I keep using this platform as ONE of the tools, besides others to connect each others. 5. Facebook, as one of the tool, beside other tools to support my activities. Wisely, in my humble opinion, we can not ask people to delete or leave this platform. But, we can advise them to do a filtration there. As its offered many negativity, we can use a filter to reduce the negativity. I usually "unfollow, unfriend or even block" the accounts who deliver negativity such as spamming, scamming, spreading hoax, etc. Enriching facebook feed by positivity to make it positive. It is simple, right? What about you? Do still use facebook? I still have an account, but I didn't actually use it, because there was a class group during school, so we communicated through the group on Facebook, I feel for now Facebook is less desirable, because it looks too crowded and lots of advertisements. I use Facebook to contact people in the fringe of my circle of acquaintances whose phone numbers I don't know. That's pretty much all I use it for. I don't participate in discussions with my friends living in different localities any longer because I can talk to people on Steem just as well and earn money while at it. There is absolutely no reason to enrich the likes of Zuckerberg and to help the US government to spy on billions of people any further. Yes I'm still using Facebook because my all friends are connected with me on Facebook so I can't exit now. And Facebook is still one of the best social site and day by day they are trying to improve sites and building strong social networks. Facebook is user-friendly and easy to Handel that's why I like Facebook. So there is no reason for leave Facebook. There are many benefits of Facebook we can connect Facebook account for gamges login like loodo,PUBG,CLASH OF CLAN and many more. Playing games through Facebook account we can share gamming status with our friends and also we can able to play online game with our Facebook friends. Playing online game with our friends is best gamming experience. That's why we need Facebook . I have found my old friend by Facebook helping. My friends who since in elementary school can meet me virtually because our distance do not support us to meet each other. As a blogger, sometime I found the update news about campaign of products comes from Facebook. There are many groups in Facebook that open chance to be reviewer, buzzer or just testimonial person. it's hard for many people to remember many things at once. By opening Facebook every day, helping us not to miss our friends' birthdays. News feeds now not only display status updates and activities from our friends. With time, various news platforms began to push their content on Facebook. Facebook itself has a feature called Instant Articles, so you can open articles directly on Facebook that have been opened without being taken to a new tab. Many of our friends are from various regions. Facebook's existence, has helped millions of people to connect with their families and friends. Yes, I am still on Facebook, but I do not sign in on Facebook very often. After a couple of weeks, I logged in Facebook today. I got some messages and replied that. Most of my friends and classmates are still on Facebook. That's why, I'm still using it. One can build a solid team of friends and Steem-based group on facebook. Yes i am still using Facebook because i think Facebook had some internal issue with leaking the real data and there they have taken the steps towards safety quickly of our data and also they have paid the penalty for it. Facebook is very interesting and my whole community is link on Facebook where i can enjoy my friends posts and my foreigners post and i also can do my business and promote my Plans to them on Facebook and i can connect the real people on it. Facebook had some issue but leaving it is not the solution of it either you should not give your personal data such a mobile number or AAdhar card number on Facebook or share with anyone because this is online fields anyone can get scammed and may leaked their data as Facebook has done in past. Facebook is also helpful in connecting account with many different big games for example Pubgy it is the game which we should connect with Facebook and then only we can play so i think i am using Facebook and its a safe for me because i am PRO user of Facebook and i have got all the privacy from team Facebook. I am still using Facebook because due to latest update on Facebook we can post story on Facebook and also we can make our website popular with the help of Facebook page and many more are there so I am still using Facebook. Before some years when Facebook was launched their motto was people can post a image and they can chat with each other from one country to another country but due to new technology and media people mostly like to upload photo and story and make their own page. The craze of Facebook is slowly and slowly going down due to various media platform such as WhatsApp,Instagram,hike and many more application came in market and so people are using using Facebook often only. I like the application Facebook very much because when I want to post my photo on Facebook ,I can upload it at anytime and also there are high security in Facebook so it does not get hacked. Yes. I keep using it and another of my social media accounts to share the link of my steemit article to reach more awareness/audience. I still keep using Facebook because i like to know what my friends doing. It's nice to be informed about them. I mainly just get on there to look at funny stuff like memes or to talk to old friends that I have not seen in a long time. I have pretty much purged all the "fake friends" who I never really knew but accepted their friends requests for some reason or another. What is the greatest thing that happened to you using cryptocurrency?What can we give to this world?What is the important of Questioning?Why is it important to hear others answer in such trivial question?Is democracy really better than monarchy?If Steemit Inc. goes bankrupt by then do we have to pay its commitment from the money in our wallet?Can election promises be trusted?What are we wasting our Lives on?What is your one and only wish in life?What you do to calm down when youre angry?How can we find foreign girls for relationships?